The history of African American art is rich in its “cataloging” (for lack of a better term) of the African American experience. This was the aim of the Harlem Renaissance. The depiction of African American life in the US combined with recognition of African heritage has been a strong vein in African American art. I think that Michael Richards is the perfect melding of the two ideas. His work is both physical and spiritual, in that it deals with a forgotten element of our history as Americans. Between 1941 and 1946 there were 996 African Americans who became certified pilots for the army air corps, a fact that seldom gets printed in history books about World War II (1939-1945). Richards, like so many other African American artists, was trying to update awareness of contributions of African Americans to US society. Born in New York, Michael Richards grew up in Kingston, Jamaica. The connection to African art there remained a strong influence on Richards when he returned to New York in adulthood. Going against the expectations of his Jamaican family, Richards decided early on to be an artist. He received degrees from Queens College and NYU. In 1994 he became a member of the Artists in the Marketplace program at the Bronx Museum. As a part of the World Views program in 2001, he had a studio on the 92nd floor of the World Trade Center, and was killed there on 9.11.2001. Ironically, a large part of his work had to do with airplanes. The Tuskegee Airmen Series celebrates a little-reported aspect of World War II, a war in which African Americans took a large part, albeit in segregated units. The Tuskegee airmen won more than 150 Flying Crosses for Valor because of their aviation skills. Richards was trying to promote the recognition of these brave Americans in his work, instilled with his African heritage. The Tuskegee Airman Series figure is a conscious reflection of the African nkisi nkondi (power) figures. The nkisi nkondi are used by village religious specialists who are responsible for the well-being of the community. Each nail or object inserted in the figure represents a prayer or legal settlement. 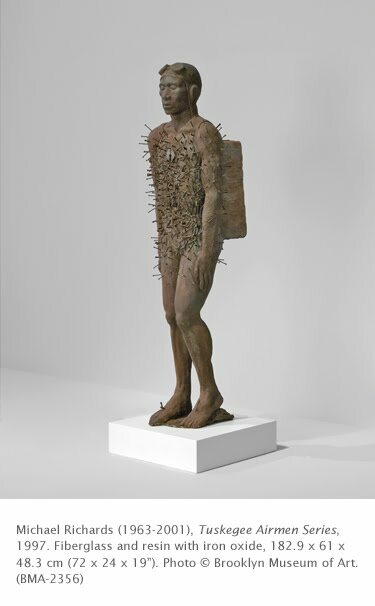 For this sculpture Richards made a mold of his own body and pierced the form with nails (other works in the series were pierced with airplanes). 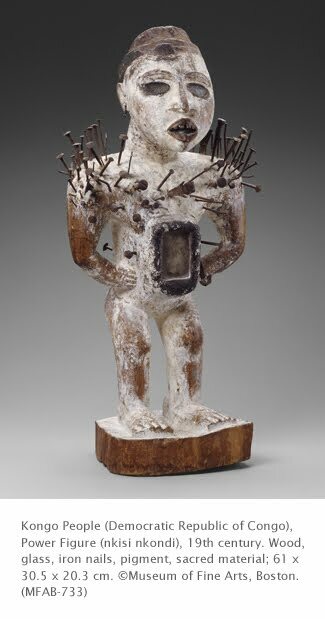 The work refers to both the Christian Saint Sebastian (a person who refused to lie about his faith) and the nkisi nkondi (a healing image). Richards did not live to witness the surviving Tuskegee Airmen receive the highest civilian award bestowed by Congress, the Congressional Gold Medal, on March 29, 2007. Wow. What a great blog site. Will continue to read on.